This hang tag is from a Vera Bradley bag. 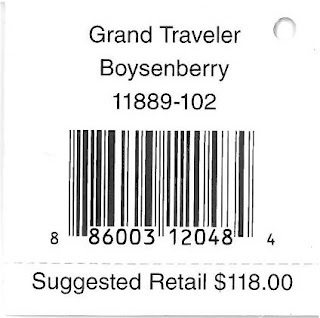 Although apparel is probably the most common use, hang tags appear on all sorts of products. Purses, bags, and handbags are closely related to apparel anyways. This one comes from a “Grant Traveler” bag. The front is a matte green, with the brand name in flowing cursive. Vera Bradley is known for its bright, colorful prints, and the stores are awash in sunny pastels. Thus, the single tone hang tag is somewhat incongruous. The cursive is well executed. It is flowing and full of flourish, which calls to mind letters written by well-heeled ladies, exactly the clientele that Vera Bradley markets too. The reverse is plain as well. 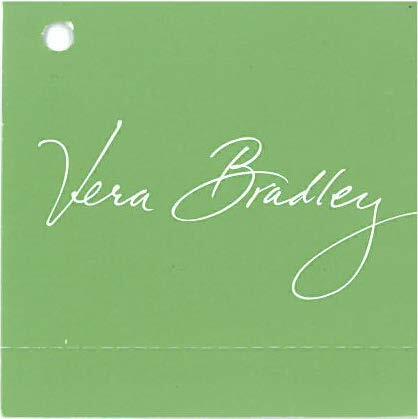 The product name leads, but almost more important for a Vera Bradley is the “pattern” name. Here we have Boysenberry. The names of the patterns deserve their own column, surely, but in this context they can be understood as tangentially descriptive. Still, Vera Bradley has done a good job of setting up both a “buy the matching set” and a “collect them all” approach to their color schemes. I like this tag. It is unexpected, as high end luxury goods often spawn the overdone, unnecessary hang tags. Here, Vera Bradley is understated, with simple elegancy. I also appreciate the somewhat stark, but entirely practical, reverse side. 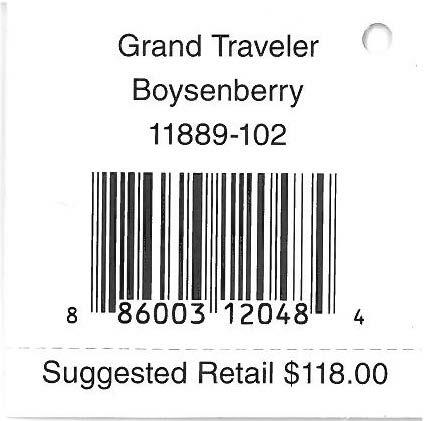 The only issue I have with this type of a hang tag is that on larger items (such as luggage pieces) it has the potential to easily be lost in the folds. In a store that sells Vera Bradley exclusively, this is fine, but anywhere else it becomes problematic. Also, for the dedicated gift buyer, these small hang tags can easily become a nightmare. Nonetheless, this is overall a nicely done hang tag.